Coming soon from Fantasy Flight Games is Winter Tales, just in time for winter to be over! In each game of Winter Tales, players control the actions and efforts of popular fairy tale characters, as the factions of Winter and Spring battle for control. On the side of Winter, characters such as the Wolf, the Mad Hatter, and Candlewick work to squelch the rebellion and ensure that Winter’s reign is never broken. Spring’s supporters, on the other hand, include characters like Alice, Grandma Dorothy, and Pinocchio, who must stage daring raids and lay cunning traps in order to break the soldiers’ hold on Wintertown. At the beginning of every game, players are split between the two factions battling for control of Wintertown in order to accomplish their own victory. Each turn, a player activates one of his characters and draws three Story Cards, before having the option to move that character and engage in various activities, such as questing or generating new quests. 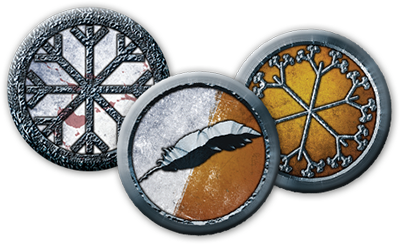 By completing various quests in key locations around Wintertown, the factions of Spring and Winter are able to achieve victory. Each faction can begin different quests, ranging from finding a great artifact to making armed retaliation against the rebels. When the story surrounding a quest is successfully completed, the victorious side claims it for themselves, and places it on the Memory track. Quests on the Memory track form part of the larger tale and accelerate the game towards its epic conclusion in the Epilogue. In an ordinary game, the Epilogue is decided in favor of either Winter or Spring, causing one of them to win the game. However, if there is an odd number of players, a new faction is introduced, and one player takes on the role of the Writer. The Writer controls characters from both Winter and Spring, and uses them all to accomplish his own unique goals. For the Writer to win, he needs to keep the story from ending, forcing a draw between Winter and Spring! 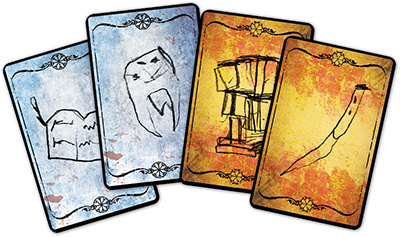 All actions in the game, whether fighting, moving, or questing, require the use of Story Cards. 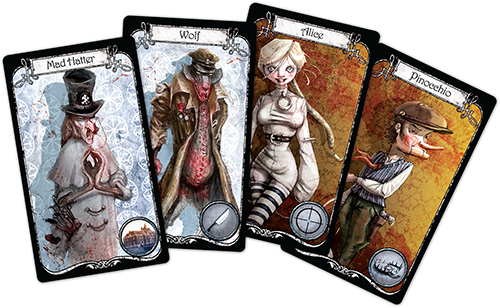 Every Story Card shows artwork that could be interpreted in a variety of different ways. As players move around the board, they must discard Story Cards and explain how the pictures on the cards relate to the ongoing narrative. For example, a player may wish to move his character, the Tin Man, to interfere with a quest that the Winter soldiers are attempting. To move. the player may discard a Story Card and begin telling his story, saying, “The Tin Man is walking the streets of Wintertown, searching for some way to secretly oppose the efforts of the Winter soldiers. But when he sees a gallows noose in the distance, he quickly moves towards it, thinking that this must be some wicked new plot of the Regime of Winter.” After he finishes his part of the story, the player would move the Tin Man to the desired location. 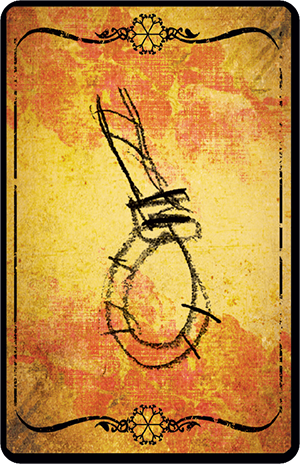 Story Cards are intentionally open to interpretation, and what is a noose for one player could be a fancy tie, or a winding path, for another player. Story Cards are also vital to making progress on quests. When players move forward on quests, they discard numerous Story Cards as they relate the narrative of their character’s efforts to advance or hinder the quest. Players from the opposing faction can interfere, however, playing Story Cards of their own and detailing how their characters are working against the quest. Players can also interfere with other characters’ movement in plazas and locations around the game board. When rebels move between locations, nearby soldiers can stop them and engage in battle. When fighting, players take turns playing Story Cards and telling the continuing story of the fight. When one side gains the advantage by playing more Story Cards than the other, the fight is over. If the rebel has lost, they are incapacitated, and are forced to end their movement. Despite their more obvious strength, even soldiers are not invincible while moving. Crafty rebels can lay traps for the soldiers in certain locations. When caught in a trap, players secretly bid an amount of Story Cards to determine the trap’s effects. If the Winter player loses, his soldier may become incapacitated, until another character saves him. In Wintertown, players compete for the triumph of either Spring or Winter, but also work together to create a narrative, telling an epic story in an intriguing and satisfying manner. Featuring a series of modules that players can add for deeper strategy, Winter Tales also embodies a mechanism for storytelling unlike any other, resulting in a huge variety of different possible games. As the Regime of Winter battles the rebels, heroic quests are undertaken, and every game becomes a memorable experience. Check back often for more updates on gameplay and storytelling in Winter Tales, visit its website.